A few days ago I caved in and bought the new edition of AoS. 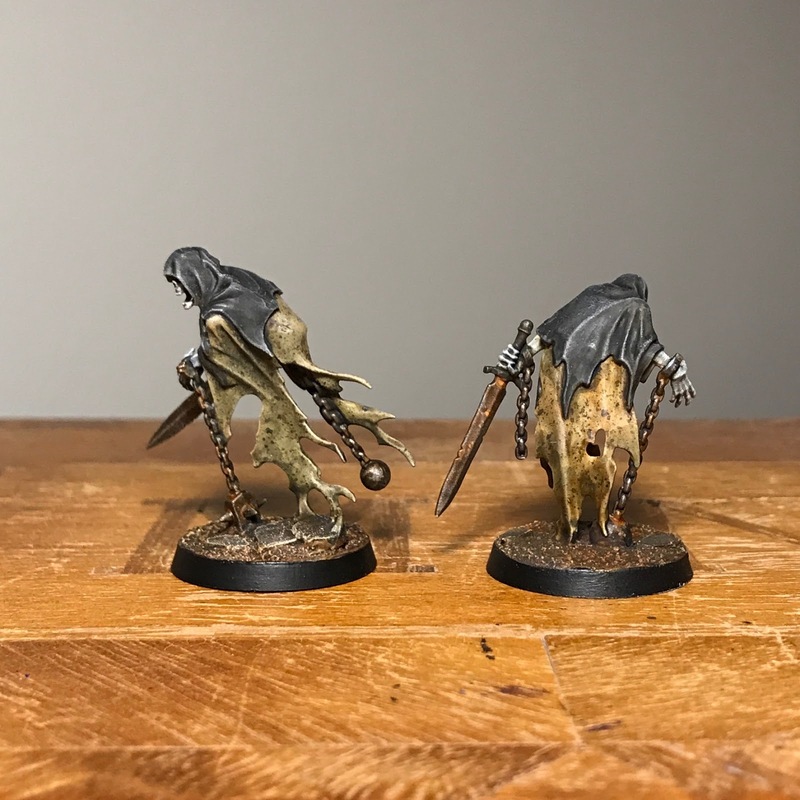 Those new Nighthaunt models are just so ghoulishly delicious I couldn't resist. It does seem Age of Sigmar has come of...well, age. In the three years it's been out there's been some really interesting armies released (apart from the constant barrage of rather uninspired stormcasts) and the new rule book itself is a hell of a lot sexier than the lacklustre first edition. There's still something off with the writing - its ponderous and humourless and just...off. Sometimes its almost as if they're using some sort of word generator that just throws out adjectives at random and there's so much aimless Michael Baystyle epic epicness about you start to skim the text after a while. Sometimes it's pretty good - it becomes pretty apparent after a while that there's many different writers involved. In any case the book is a lot better than the first outing and at least tries to create a setting of sorts. So without further ado, here's my first two ghosties. The plan is to finish up a vanguard size army (1000pts) and then see what happens. I won't convert the spooks that much other than minor details. For instance I'll probably add some nails and spikes to the characters and wraiths to make theme even grimmer, taking some cues from my old mhorrigot stuff, and remove some of the wispy smoke effects where possible. Cheers Krauty! Glad you like ’em!! 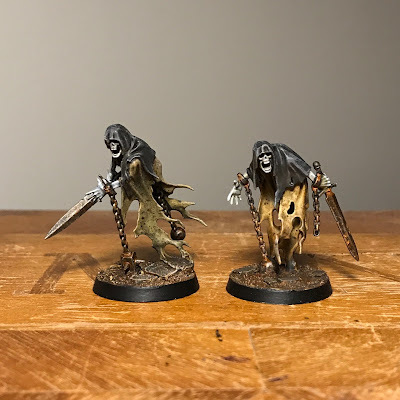 You definitely hit the right mark for grimdark, where they look like the shrouds they were interred in, without turning the grimdark up to 11. Cheers mate. That's pretty much the look I was going for! Tidy! Totally agree - whilst a handful of the minis knock me for six and make me keen to grab them, I just can't get inspired by the fluff and that, for me, is almost entirely to do with the writing which, as you say, can be hit and miss. You managed to make even ghosts look dirty. I love it! It's characterful, different from the usual smokey blue style. Can't wait to see more! Do you plan to paint the horseman too? Oh yes. The plan is to paint all of them! You know, they would look cool in a Necromunda-like setting. A sort of horror story among the dirty, claustrophobic alleys of 40k hives and settlements. I'd love to convert some into floaty mechanicus gribblies, but I'm trying to retain my focus and get a small AoS army ready. These are the best Nighthaunts I've seen. Love these. Well done for supporting the game that killed Warhammer, aos has success only because it can pillage that the original Warhammer and its creators did, even aos fanatics wanted aos grimdark as Warhammer so they come up with that aos28 a Warhammer wannabe.